Continuing efforts to snare an elusive share of commercial launches, the Japanese government and industry are planning upgrades to the country's H-2A rocket to make it more competitive in the global marketplace. First reported by Japanese media in September, the improvements were the subject of a detailed presentation at the 61st International Astronautical Congress in Prague. The first phase of the H-2A upgrades should be operational by the mid-2010s, enabling the launcher to more effectively carry dual payloads to polar trajectories and deploy communications satellites closer to their targeted geosynchronous orbits. Engineers are following a block approach to keep the H-2A's high reliability and reduce development costs while introducing new capabilities, according to Takashi Nakamura, project manager for the post-H-2A launch vehicle program at Mitsubishi Heavy Industries Ltd., the rocket's contractor and commercial operator. 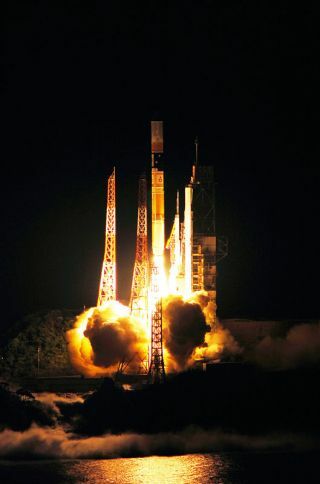 All H-2A launches to date have carried primary payloads for the Japanese government, but MHI will orbit South Korea's Kompsat 3 reconnaissance satellite in 2011 or 2012. Kompsat 3 is the H-2A rocket's first major commercial passenger. Like most Earth observation satellites, Kompsat 3 will circle the planet in a sun-synchronous orbit permitting consistent flyover times all around the world. One of the H-2A upgrades will enhance the rocket's ability to deliver two satellites to sun-synchronous orbits at different altitudes. The current incarnation of the rocket can inject two satellites at the same height, according to Nakamura. "With an upgraded H-2A, we'll have the capability to launch dual payloads to different altitudes," Nakamura said. Rocket designers plan to introduce newly-qualified features of the launcher's LE-5B second stage engine, including low-thrust firings at throttle settings of 60 percent and 3 percent, according to Nakamura. The 60 percent thrust mode was tested in flight in 2002 and an H-2A mission in May demonstrated a pressure-fed firing of the LE-5B engine at 3 percent thrust. More ground tests are on tap in the next few months to investigate other low-thrust engine settings, Nakamura said. A slight modification to the rocket's guidance system will also make possible brief upper stage engine firings needed to make small altitude changes. The other objective of the H-2A evolution program is to heave larger communications satellites to orbit and drop them closer to their ultimate destination. Engineers are crafting methods of managing the H-2A upper stage's usage of propellant. The rocket burns cryogenic liquid hydrogen and liquid oxygen, which must be maintained at super-cold temperatures to remain in a liquid state. Nakamura said the H-2A upper stage will be painted white to reduce the vaporization rate of cryogenic liquid hydrogen. Engineers hope to save liquid oxygen by employing a different engine chilldown sequence before each ignition, reducing the consumption of oxidizer. Unburned hydrogen gas could also supplement chemical thrusters to control the upper stage's orientation between burns, conserving maneuvering fuel, Nakamura said. The changes will allow the H-2A upper stage to ignite three times and coast for up to five hours each mission. The extra LE-5B engine firing will place communications satellites closer to their ultimate targets in geosynchronous orbit 22,300 miles above Earth. Rockets routinely release communications payloads short of their final destination, and the satellites must use an on-board engine for the rest of the journey. If a spacecraft doesn't need to travel as far, it can save its own fuel and extend its useful life. Japan is also designing a new payload adapter fitting to connect satellites to the H-2A upper stage, giving spacecraft passengers a more comfortable ride during liftoff. The H-2A improvements will cost nearly $200 million, according to Japanese officials. "The modifications to the vehicle are relatively minor, and they are based on proven technologies," Nakamura said. The Japan Aerospace Exploration Agency is also renovating facilities at the Tanegashima Space Center, the H-2A rocket launch site. Japan is already evaluating a replacement rocket for the H-2A, but its development has not won final government approval and its first flight is not anticipated until the 2020s, Nakamura told Spaceflight Now. Dubbed the H-X in planning documents, the new launcher would be designed to human-rating standards to support a potential Japenese manned spacecraft. "Although we know that there are many obstacles for realization of human transportation in Japan, the discussion of this issue has been more open in recent years," Nakamura said. The Japanese government is already funding studies of upgrading the H-2 Transfer Vehicle, an unmanned resupply freighter for the International Space Station, to return to Earth with cargo. If approved, the re-entry version of the HTV could be designed with a clear emphasis on its future applicability as a manned spacecraft. Engineers have settled on the H-X's basic configuration. It would likely be a two-stage vehicle with liquid-fueled engines and no solid rocket motors. But officials have not determined the specifications and numbers of the engines for the H-X rocket, Nakamura said.